MUSA is a “post-industrial art exhibit” whose content will relate more or less directly to the venue: a dormant furniture factory across from Humble Pie in downtown Raleigh. An art show in this space really resonates for me, because I have such fond memories of the crucial employment and quirky stories that arose from my artist friends’ work there in the 1980s. The owners made annual trips to Asia for antiques and prints, but the majority of the stock was furniture that was “aged” – whipped with chains and other abuse, or modified otherwise – before wholesaling to Neiman Marcus. Bill and Otho were enlightened and tolerant employers to several good friends, and I’ve always appreciated it. 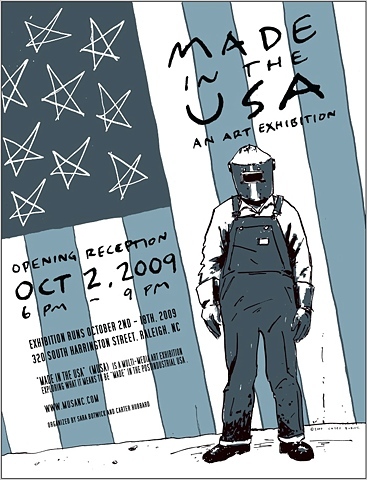 to produce an interpretive, visual perspective that will allow patrons to reflect on what it means to be “made” in the USA; a question even more poignant in these current economic times. I mentioned this show in July and bemoaned the Flash software used to present the website, which actually looks quite nice, but presents minor navigation issues and major Google search issues, because all of the info appears to be insulated from the web-crawlers. Now the site has a large amount of info and lots of artwork examples, most of which present some kind of connection to industrial themes. The work is also integrated into the factory space, including one series that explores the history of the paint in the room in which it is situated. The dying pastime of pigeon-keeping, the dying art of hat-making, Latino work portraits, and the use of trees all form a part of a broad set of responses to technological change and its implications for work. taintradio, poised to survive the “post music industry age,” sends word it will present another feature at Marsh Woodwinds. The internet radio venture has added several new shows to its weekly cycle, including Philadelphia-based Jeff Duperon’s Congo Square. Feature info below. taintradio.org & Marsh Woodwinds presents guitarist/composer Eugene Chadbourne concert & live webcast on October 3rd. Avant-garde multi-instrumentalist and composer Eugene Chadbourne brings his unique anarchic blend of jazz, punk, country, improv and noise to Marsh Woodwinds, 707 N. Person Street in Raleigh, NC on Saturday, October 3rd at 8pm. The concert is a presentation of the taintradio/Marsh Woodwinds concert series, and will be broadcast live on the Web to listeners worldwide at www.taintradio.org. Tickets are $10 at the door, and free refreshments will be served. It’s been nearly 5 years since the Greensboro-based Chadbourne has performed in Raleigh, and we are delighted to add this date to his fall touring schedule, which includes Berlin, Vienna and Istanbul. Chadbourne has been a major presence in improv, punk and jazz circles for over 30 years, including work with John Zorn, Charlie Haden, The Violent Femmes, Billy Bragg, Tony Trischka, The Red Clay Ramblers, Marc Ribot, Jimmy Carl Black and many others. Relentlessly eclectic and experimental, Chadbourne writes and plays a wide range of music, from free jazz interpretations of classic honky-tonk country to transcriptions of Bach for banjo and his infamous invention, the electric rake. Chadbourne’s dozens of solo and collaborative albums add up to one of the most consistently challenging and rewarding bodies of work you’ll find in experimental music. This is a rare chance to hear this musical legend in an intimate venue on Saturday, October 3rd. SparkCon expanded and upgraded its arts event this year, taking over Fayetteville Street with 13 different “…sparks” at 24 venues, intensely focused on the 1st two blocks of Fayetteville. From Raleigh’s emerging status as the East Coast’s gaming industry hub to the latest creation from uliveandyouburn, this street festival helps to brand Raleigh as a city of designers and 21st century entrepreneurs. And as a final note, we head toward the “post newspaper industry age” in the company of Raleigh Public Record, whose detailed candidate profiles and “Sunshine” public record posts are demonstrating the validity and value of Charles Pardo’s vision of 21st century journalism. My nature column at RPR will return as soon as some of my excess pies get cooked!